A few months ago my dad mentioned to me that he was planning a trip to Buffalo, New York sometime in October. Although my dad now lives just a few minutes down the highway from me, he, like many current Houstonians, migrated here for work years ago. My dad grew up in Kenmore, New York, a small suburb between Buffalo and Niagara Falls in Western New York. My dad’s entire side of the family is from that area and for the most part, still reside there. My dad visits every few years or so to check up on my aging grandmother, his friends, and the rest of the family, however, due to my own hectic and oft-times unpredictable schedule, I have not been able to visit in nearly a decade. I had not seen some of my other relatives in New York in much more than that. For shame. This year my dad was planning on flying (literally) solo, so while I helped him search for airfare deals online, I decided that I needed to bite the bullet, take the time off, and visit my family. A few coupon codes and Southwest web deals later, we were set. I travel a fair amount for work and pleasure. When I’m researching a locale I always have a list of things I would like to see and photograph, however this was the first trip where I really had no expectations of what I wanted to do or photograph. Although I had not been in some time, I did remember a lot about the area and really just wanted to spend some quality time with my grandmother, the rest of my relatives that I never get to see and my dad as well. Even though I am always “connected”, having the 10 days or so of not working and stressing out was definitely worth it. Several days of this trip were spent at my grandmothers house in Kenmore. The same house she has lived in since 1947. My dad was a baby in this same house. In 1947, my grandma, a then-newlywed, could look in all directions from her lawn and see vast, expansive, nothingness. Now there is a bustling suburb. She grew up with her many siblings in a house not even a mile from this house. A gas station sits where that house once stood. This one still going strong, needs constant upkeep. My dad and I help paint and install a new front door for her; amongst other things. If you’ve ever talked to me about family, or archiving or memories, you’ve probably heard me run on for hours just like I probably am or will here, but it was absolutely mind-blowing to me that I have lived in close to 20 different houses, attended 10 different schools and my father is sitting in the same place where his crib once stood in the mid-1950’s, recalling events like they just happened. I guess it boils down to; some people move around a lot and some don’t. I occasionally hear a friend talk about something their parents found in their attic from way back; a toy, a photo, a memory. The fact that I moved and lived in several different places, means that my belongings, my things (for lack of a better word) were combed through, siphoned, and filtered off so much that I cling to the few things I can identify with for dear life. Besides a few small items here and there, I can’t walk into my mom’s house and see the same coffee table that my sister and I almost broke when she was 1 or the same nightstand that was in my room as a child. Maybe it’s absurd to think about things in this way, but its definitely something interesting to me. I feel this way about family photos and photos in general, given my profession, but I also feel this way about objects and other memory-producing ephemera as well. Sometimes I look back at a set of old photos and remember events and details about when the photo was taken. Sometimes I wonder if I only remember certain things in the past BECAUSE of the existence of a photo or object from the event. If I had 20 toys as a kid and there are photos with 4 of those 20 toys, after years and years of looking at those photos, my memories of my childhood toys are focused around those 4 photographed toys. This notion paired with my obvious love of photography drives me to not only search for real moments as an artist, but also to document everything around me. Sometimes I fear that if I don’t photograph something, I might forget it. I don’t want to forget, so I shoot everything. The question is: Is it a blessing or a curse? 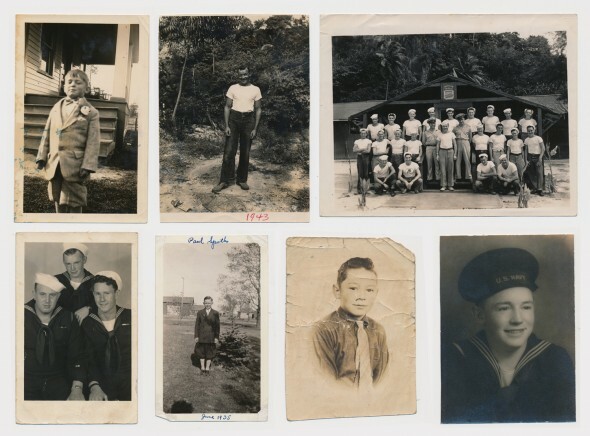 Several photographs of my grandfather, Paul Spoth. He was a US Navy Seabee. I digress. After several days of helping grandma around the house, my grandmother told me she was going to donate some old photos to the town’s historical society. I immediately piped up and asked, “WHAT PHOTOS? !” She had a box of photos of her mother, my great-grandmother, and lots of various family photographs that she figured no one wanted. She said she had asked several of her sisters about them, and no one else wanted them. “They all have too many pictures,” she said. These are our history. These black and white images from the early years of the 20th century document our family’s life. Why am I the only one who thinks that is important? I want to be able to show these to my eventual children. I wanted them all. They belong to us and not some historical society. 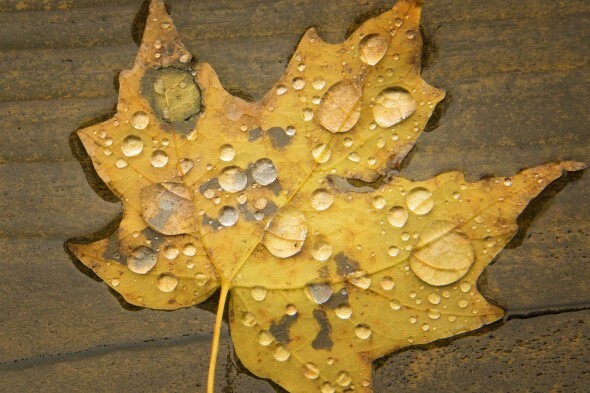 My favorite image (below) was is an original 8×10 mounted to a piece of cardboard. It is a group portrait of my great grandmothers school (yes school, not the class, the whole school) from 1914. The photo is about a year or so shy of being 100 years old. All of the students names are carefully labeled in pen on the back of the mount. I instantly fell in love with the photograph and the others that came with it. 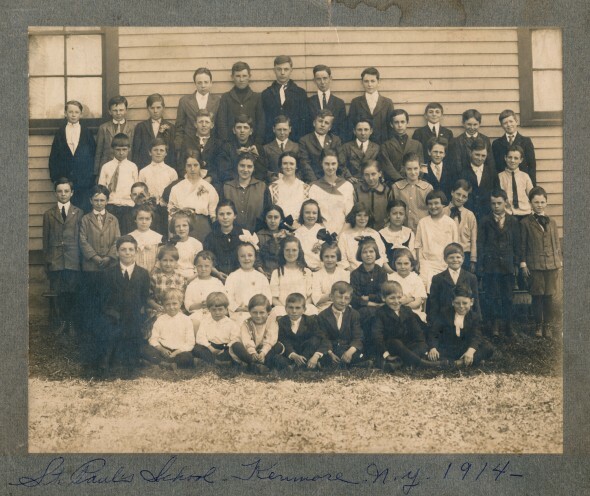 School group portrait of my great grandmother, Margaret Heimiller, from St. Paul’s School in Kenmore, NY from 1914. In between odd jobs at grandma’s house, we met up with several of my dad’s high school friends. Somewhere in there I realized that although decades apart, my dad and I had very similar high school experiences. I have lots of friends that look back on their high school selves and loath what they remember about the time. My dad and I both had a great time in high school and have a core of really amazing friends that we both still keep in touch with today. He has several friends that we met up with that I remember meeting as a child. They are pretty much like family to him, therefore they are like family to me. On a not-so-philosophical note, one of my dad’s good friends who also graduated high school with him, admitted to listening to Drake, Lil Wayne and Lady Gaga via Pandora on his iPhone. My dad can barely operate his antiquated phone, let alone a computer, email, the Internet, et al. It was very interesting to see this group of guys that all grew up together at various places in life; so different, yet so similar. I wonder how my friends and I will be 3o years from now. Visiting old friends went hand in hand with experiencing some of the best food joints Western New York has to offer. Obviously a stop was made to Duff’s which is famous for their Buffalo wings, but my favorite area staple are the subs. In Texas we have Subway, Quiznos and the like, but the mom and pop franchises in New York like John and Mary’s and DiPaulo’s make THE best subs that I have ever had. They are seemingly so simple, but the bread is what makes them. I must have had 4 or 5 salami subs during my short visit. Other noteworthy stops included a lemon ice from Anderson’s, a beef on weck from several spots, a few foot longs from Ted’s and an amazing pizza from Bocce Club. The food is so good that my dad, who grew up on some of the above staples, filled his carry on with about 140 frozen Sahlen’s hotdogs and 8 jars of Weber’s famous horseradish mustard, because frankly, you can’t get them elsewhere. My dad and I also made a stop at Spoth’s Farm Market, which is a local produce shop owned by my grandfather’s cousins. There was a photo of my grandfather taken in 1938 on the wall. They may not have been immediate family, but it was just crazy for me to be in the proximity of family and to see my name on the sign out front. There were jars and cans and products with “Spoth” on them. Wild. Just being around my aunts, uncles, cousins, and grandmother the whole time was awesome for me. Back home in Houston I have my dad and thats about it for the Spoth’s. We are a rare breed. My family and the cousins and their cousins and all the rest of the Spoths are all over Western New York. It was surreal. 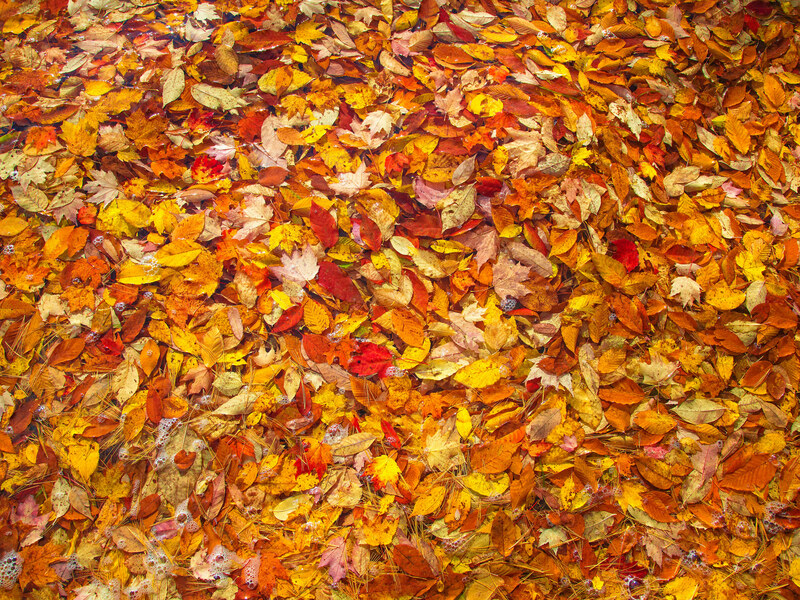 I was like a kid in a candy store with all of the fall color around me in Old Forge, NY. After a recommendation from a friend, my dad and I drove out to Letchworth State Park to enjoy the fall foliage which was close to peak. We hiked up and down to different vistas and marveled at the leaves, the waterfalls and the beautiful scenery. My dad recounted his mischievous high school memories of the park. I took photos. It was amazing. As if that wasn’t enough, my aunt and uncle took my dad and I to their cabin in Old Forge, NY in the Adirondack mountains. They bought the place since 89 and have made the 4 hour trek to upstate New York hundreds of times since. They boat and swim in the several lakes during the summer and ride their snowmobiles across the lakes during the winter. It had been years since I had been to the cabin. It was in the 30’s or 40’s I believe. We had the fireplace on non-stop and spent the weekend exploring, hiking, climbing and eating. My aunt replicated Thanksgiving in honor of our presence, complete with homemade pies and dishes using fresh veggies from her own garden. My grandfather was a farmer. It’s in our blood. Some of the best fresh produce can be found in these parts. On Columbus Day, after our return from Old Forge, I decided to take a solo trip across the border, into Canada, and explore for the day. I would have liked to take my dad, but since he was without a passport, I had to go it alone. The rainbow bridge across to Niagara Falls, Ontario is about 15 minutes from my grandmother’s house in Kenmore. I explored on the Canadian side of Niagara Falls, saw the craziness of Clifton Hill, and then ventured north to Niagara On The Lake. I have been to Niagara Falls numerous times as a kid, but it never gets old. Niagara On The Lake and the drive up River Road was amazing. NOTL is probably one of the neatest little towns ever, with shops and restaurants and flowers and beautiful weather. There was a Starbucks, but it was in a building from the 1800’s. I went all the way to Lake Ontario and looked out across the blue abyss. I squinted and saw Toronto on the other side. It was an awesome day. 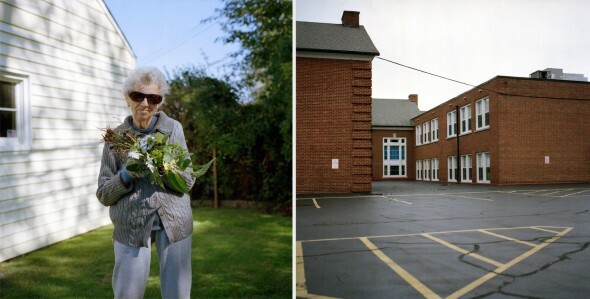 Hasselblad diptych of my grandmother clutching a bouquet of weeds paired with the place my dad attended boy scouts as a kid. The rest of the days we spent with family, with grandma and taking it easy. I used my Hasselblad to make some simple portraits and still lifes of different locations around town that my dad drove me by. In the above diptych I had my grandma pose while she was weeding a section of her flower garden. “This is my bouquet.” she said. My grandma looks a lot like the cartoon, Maxine. The image on the right is of the building my dad went to Sunday School and Boy Scouts in. All my expectations of spending time with family were fully realized. I saw more waterfalls than I can count, ran through piles of orange leaves like I was 8, and got to wear my winter jacket for a whole week straight! I would probably curse everything after a few months of their debilitating snow, but Western New York in early October is beautiful. Everything is so close and the “traffic” is almost laughable compared to Houston. It’s surprising that I made it back at all. Until next time NY. 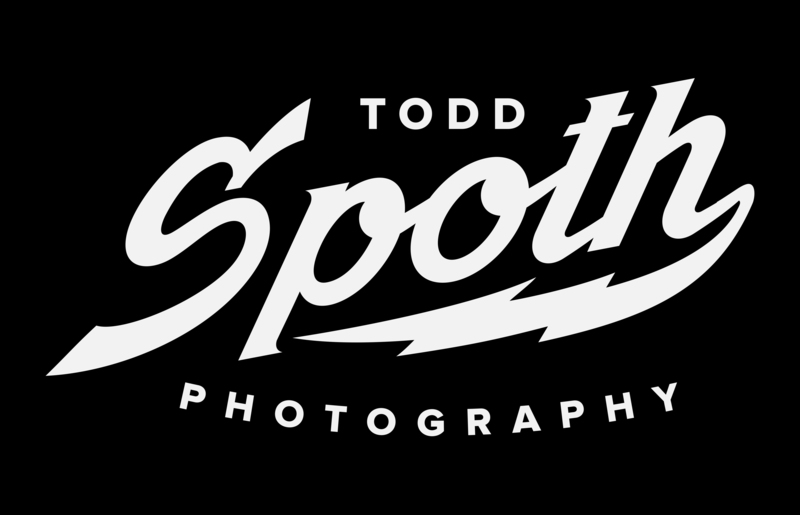 Check out both slide shows below to see my digital images as well as my Hasselblad frames and let me know what you think!